We manufacture our own rosettes and every single one is made to order so you can have any style, any combination of colours, any centre print and any tail print on any rosette. 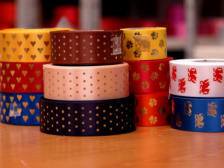 Not only that but we have in-house facilities to print your organisation’s logo or any other design you require onto the ribbons before they are used to make the rosettes, to make them even more unique. Our catalogue provides details of some of our rosettes but you are by no means limited to just those. 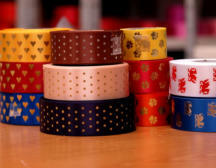 Just take a look through our gallery to get an idea of the huge range of designs we can supply. Many customers like to have a theme for their show or event rosettes. Typically this would be the use of the club’s colours across all of the rosettes for a show, or it might be something special for a special event, for example the use of gold in all the rosettes for a 50th anniversary show. We pride ourselves in working to our customer’s requirements, whatever they may be, and are more than happy to make suggestions if you are unsure what will work for you. 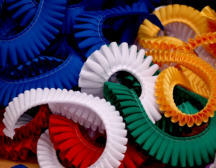 Don’t forget that we have no minimum order so if you only want to order a Best in Show rosette, for example, that is fine – it can still be fully customised to your requirements.